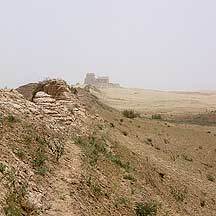 One can generally say that the entire Great Wall runs along the lower borders of today's 内蒙古Neimenggu (Inner Mongolia). 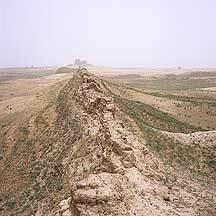 Although at different times the Wall was shifted higher or lower, it was more or less in the same pattern dictated by geography. 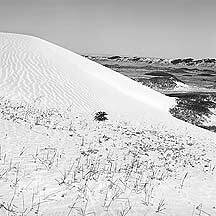 And almost its entire length, save the northeast section, borders or runs through sandy or bare deserts. 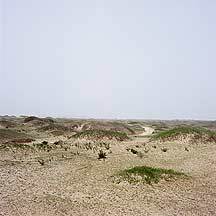 Of interest to this page is the section that runs through the sandy desert areas within the great bend of 黄河Huanghe (Yellow River)— going southwest in a low dip passing the frontiers of 神木Shenmu, 榆林Yulin, 靖边Jingbian, 定边Dingbian, 盐池Yanchi, and then turning back up toward 银川Yinchuan. 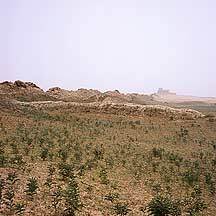 This region, known as the Ordos, has strategic importance in the far past; and the earliest records indicated frequent fighting in this area. 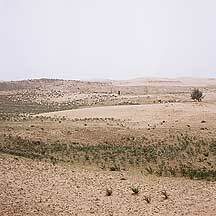 The invading normads or 匈奴Xiongnu in the north would normally cross the Yellow River and settle in this area. 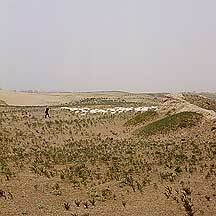 From here the horsemen can move quickly down to the Han capitals, such as 西安Xian and 咸阳Xianyang. The great goal of generals in those times was to drive them out of this area. 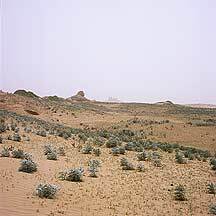 During the Qin dynasty, general Meng Tian stationed in this area after he drove the Xiongnu beyond the Huanghe. Of these places I had been to Yulin city, and from there I took the bus to one of its counties, Dingbian. Between Dingbian and Yanchi is this section of the Great Wall which I simply call — 定边长城 - 三五九旅窑洞Dingbian's Great Wall. Watch my short video clip of Dingbian's Great Wall. 26th of June, 2006. I was at 榆林市Yulin City. I decided to go to 定边县Dingbian County (1) because I saw more Walls there on my map. 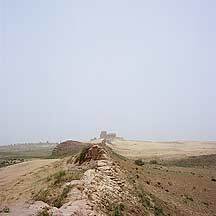 As a matter of fact, there are Walls everywhere along the outskirts of Yulin's counties. From Yulin's 汽车南站South Bus Station I bought the ticket (Y57) to Dingbian. The big bus stopped for half an hour at the 凌宵广场Lingxiao Square to pick up more passengers. Then waited some more beside the highway. Afterwards, the bus headed into 榆靖高速公路Yujing Expressway, then into 吴定高速公路Wuding Expressway (2), and finally stopped at my destination. The entire ride, with the waitings, took about 6 hours, so give yourself some time. 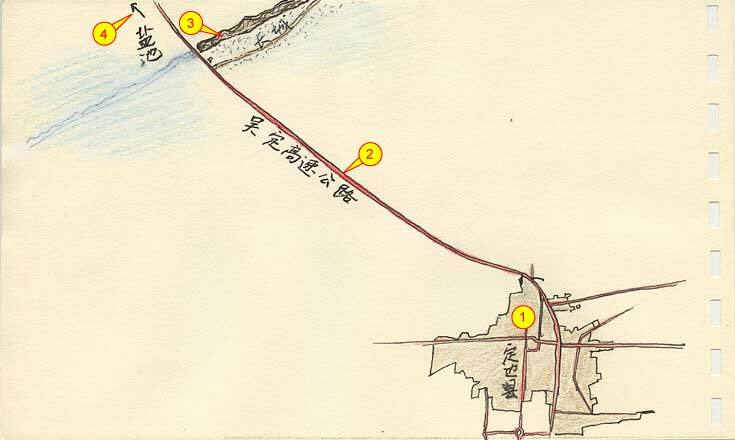 The Wuding Expressway connects Dingbian and 盐池县Yanchi County (4), which belongs to 宁夏Ningxia Province. Theoretically, you could get a ticket from Yulin to Yanchi and ask to be stopped at the Wall. But I stopped at Dingbian, and from there I took the local bus to Yanchi (see map above). Once in Dingbian, you could take the #1 local bus to the bus station on its north border. The station is just an area where buses stopped. It was about 400 meters from the Wuding Expressway. There were many buses (Y6) to Yanchi, which is about 30 km. away. The ride to Yanchi will take 30 mins. or so, but 15 mins. into the ride you will see the Wall(3) beside the road. Ask to be dropped off here. You can follow the Wall as far as you like. It is a good idea to spend a day or two in Dingbian. Unique in this town that I had never seen elsewhere were the many internal interlocking earthen walls. Living spaces were dug into these thick walls, which were about 3 meters high. Unfortunately, alot of the huge walls were being flatted into long streets. You have to see it to be amazed. Dingbian is a small town, so hotels and guesthouses were few and its interiors were kept to the minimal. I found a room at 长城南街South Great Wall street, one of the main thoroughfares of the town. 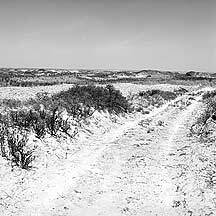 The dirt path along the frontier Wall was mostly of fine sand. Wear appropiate attires. There may be sandstorms, so bring a pair of goggles. 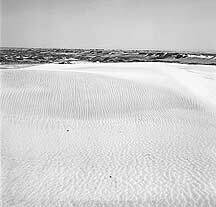 You can be lost if you travel deep into desert, so a compass or GPS would help. Water is the most essential on this trip, bring at least 2 liters. Bring food. You won't be seeing anyone selling water or food here.